What is the first thought you have when going to your mailbox each day? Is it a feeling of dread? Curiosity? Eagerness? I’m going to guess that we all look at our mail and think something along the lines of: “Ugh, what kind of junk am I going to find in the mailbox today?” Right? It was very different when I was growing up in the 1960s and 1970s. As a child, I was excited when the postal carrier came. I loved to grab the mail out of the box. Before bringing it inside, I would flip through the envelopes with anticipation, searching for any handwritten ones. They didn’t necessarily have to be addressed to me. I just loved that someone in another family had written a letter to someone in my family. Today’s mail is different. Nowadays, most of our friends and family inform us of their personal lives via texts or e-mail. Therefore, it’s rare that we receive a letter. Today, it’s mainly bills, statements, advertisements, special offers and promotional mail. And there’s much more mail than there used to be. Many people say they receive no less than eight pieces of mail per day, most of which is just plain junk. That’s why handling today’s mail can be a nuisance. For some, it’s hard to decide what to file, what to keep, and what to discard. So it piles up in baskets, on desks, on the floor, and sometimes even in bags. Those bags! They’re the worst. Ask anyone who uses this sort of “filing system”. When visitors are on their way over, the bags end up all over your house as you stow them in closets, under furniture, or whichever room you declare the “closed door room”. Two of my most recent clients had more than the usual amount of trouble keeping a handle on their mail. One had lost control of hers after a lengthy illness and was faced with several bins of new mail mixed in with older paperwork that a family member had pulled out of her files in order to figure out what bills needed to be paid in her absence. The other client had been afraid to dispose of mail for years, holding onto both opened and unopened envelopes spanning back almost fifteen years. It was overwhelming for both of them. No matter the problem with your paperwork, it could potentially take over your home and cause you an inordinate amount of stress if you’re not handling it promptly. Next, turn to or walk right to your designated inbox container with the mail still in hand. We start the process of reviewing the mail right here at the end of each work day so we can dispose of the junk mail as soon as we enter our home and then proceed to our much deserved winding down. Rip open the offending envelopes and get right to it. You know all that extra crap that comes with your bills? Little inserts and advertisements? Immediately toss all those “ugly guts” right into your recycling box or basket. I promise you the first time you do it you’ll find yourself wondering how something so simple could feel so satisfying and, more curiously, why you waited so long to adopt this simple process. You’ll want to handle everything you’re holding in your hands. When you open bills, look at the amount owed and due date, write that that info on the outside of the envelope, then put the paperwork back in the envelope. By noting this particular info on the outside of the envelope, you can quickly peruse your bills and know which ones to pay when. Keep all of these bills in a second, separate basket just for bills. There’s no other thinking needed. The recycling of the mail is done for the day, the bills are in one place and you even know when they’re due. 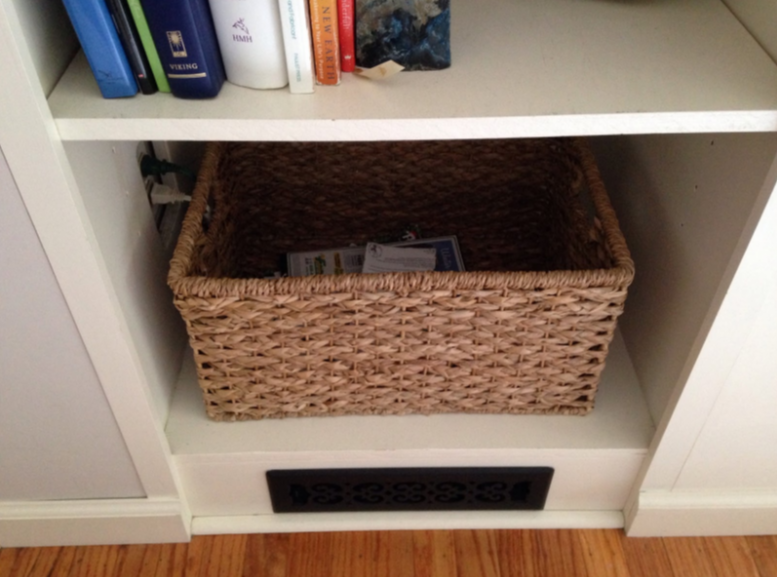 You can even keep your checkbook in the bill basket. After all, if you’re good at budgeting, you’re going to need it to record your payments anyway… And if you’re no good at budgeting, or don’t even have a budget at all, well, Lighten Up has a blog for that too so stay tuned. Stuff to shred. Yes! Invest in a shredder. You won’t regret it. You’ll want to shred any confidential or secure information that is extraneous so it doesn’t crowd your filing cabinet. We shred those “fake” checks for cash advances that come with our credit card bills and any type of “special offers” that might have our personal information on it. Items you you might want to reconcile (bank statements, etc. ), look into further, or file. So, keep another basket for this stuff if you think keeping it with your bills will be too confusing or stop your momentum when paying bills. Now, here’s the hard part. You have to train yourself to take care of all of this stuff once a week. Yep! Once a week! I know some of you are wincing. It’s okay. Remember, since you’ve gotten into the habit of purging daily, the weekly bill paying and filing is much more manageable and moves much more quickly. What once took an hour or more and was always put off because no one made the time to do it, now takes mere minutes since all the extraneous junk is out of the way and you can tend to just do the filing of a very small pile of manageable pieces. This is really less painful than you think once you get into a natural rhythm of doing this weekly. And if you have budgeted for your bills, another future blog post will be about budgeting and keeping accurate records, it will be easy to maintain this rhythm. So, once a week, pay your bills, reconcile statements and file it all. If you need help with setting up a junk mail/recycling station, figuring out where your home office should be set up in your particular space, or creating a filing system, call Lighten Up! We’re pros at this!